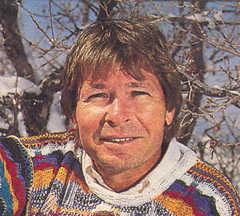 John Denver's introduction to the GENI Video, "What If... A New Global Option"
From the time I was a small child, I've been in love with nature  the mountains, the ocean, the deserts, the forests. Nature has always been the greatest source of comfort and inspiration in my life. And certainly my music is filled with metaphors from nature. As I've had the opportunity to travel around the world, I've grown to appreciate all of mother nature, all of the earth and it's people. It pains me to see the damage we do to one another and to the planet. I am personally committed to doing whatever I can to make it better for all of us. It is the purpose of the Windstar Foundation to be a catalyst for responsible action on a global scale toward a sustainable future. I believe that it's going to take all of us working together to solve the problems that confront us. Whether it's ending hunger, promoting world peace, or creating a healthy environment. I believe that each one of us makes a difference. From the first time I heard his name, Buckminster Fuller was a hero to me. It was one of the greatest thrills of my life to have met Bucky and beyond that to spend time with him and to develop a really close relationship. Bucky was an incredible inspiration to me as he has been to people all over the world. Bucky personifies for me the difference that an individual can make and the possibility of what one man can do. That in fact was the name of the song that I wrote for Bucky on his 85th birthday and in that song I talked about Bucky being the Grandfather of the Future. You see Bucky always presented us with the big picture. The video that you are about to see explores the potential benefits of a global option that Bucky proposed 20 years ago. This proposal supports a global plan for ending hunger, third world development, environmental benefits, stemming the population explosion and a universal increase in our standard of living. The proposal presented in this video offers a unique solution to many of our current global problems. Over the past 3 years a network of people around the world have been educating us to it's benefits and encouraging us to take a stand for its creation. Due to their efforts, the project has created a focus for global cooperation. I invite you to watch and listen carefully, because it's important. And then to take action. The video will show you how. Thank you. Contact GENI if you would like to order a copy of this video (click here to order the video on-line).